The folks at Royal Enfield have put out a teaser saying that they’ll be ‘unveiling their next chapter at the 2017 EICMA auto show’. Considering that the next big thing from Royal Enfield is its entry to the 750cc segment, it’s very likely that the new 600-750 cc twin cylinder bikes – that the Indian motorcycle major has been testing for more than a year now – will find expression at EICMA 2017, one of the biggest yearly congregation of bike makers from around the world. The new bike is expected in two variants – a cafe racer similar to the Continental GT – and a more relaxed street-bike. Both motorcycles will land into India sometime next year, with an India-premiere likely to happen close to the 2018 Auto Expo. The bikes will use a newly developed, parallel twin four stroke engine. This motor is likely to put out 45 Bhp-60 Nm, and will be the most powerful engine ever-built by Royal Enfield in India. The motor is expected to be a mix of old and new. Modern bits could include an overhead cam set up and fuel injection while the old school bits such as air-oil cooling and two valves/cylinder are expected to be retained. The focus of the engine could be on fat, low and mid range torque delivery, to make it a very usable on an everyday basis. A long stroke layout could help achieve this. The motor will sit in the same frame that was first seen on the Continental GT. Designed by Harris Performance, this twin cradle frame is one of the best handling units from Royal Enfield. Suspension and braking bits seem to be borrowed from the Continental GT. While the new Royal Enfields will take on the Triumph Street Twin and Harley Davidson Street 750, the bikes are likely to be priced much lower. A starting price between 3-4 lakh rupees is anticipated, making them the most expensive Enfields ever sold here. 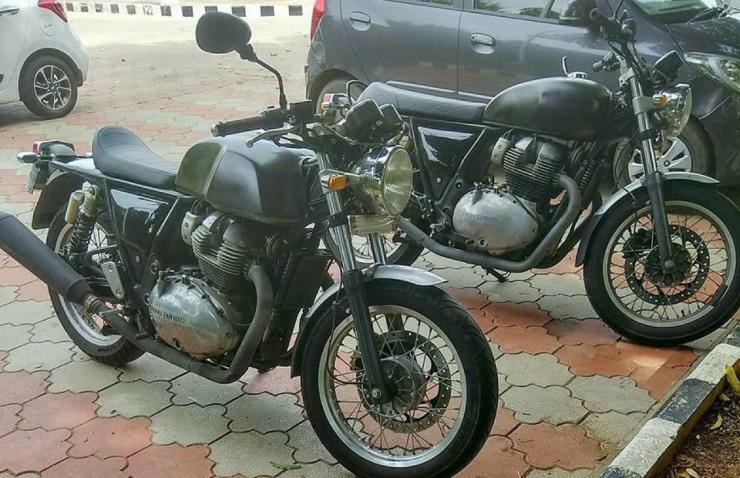 This is expected to make them very attractive to retro-bike lovers in India, who for long, have been starved for affordable, multi-cylinder motorcycles.